We were supposed to see Audra McDonald at Carnegie Hall on December 12, 2014. Unfortunately, she postponed due to a work conflict. We finally saw her on Wednesday night, April 29, 2015. She was just a little late; but, for the show she gave us, she is certainly excused for her tardiness! I have seen Audra in concert (mostly at Carnegie Hall!) and on Broadway here in New York many times now and I am never, ever disappointed. In fact, I'm usually thrilled. Her performance this week was definitely thrilling. She gave us almost songs from the musical theatre, both from the golden age of Broadway and modern musicals, and with just a couple of standards thrown in for a treat. I love Audra - her stage presence is magestic yet humble. She says what's on her mind and she shares hilarious anecdotes (i.e. I was the darkest Mother Abbess ever; Chipotle is my office; "Audra McDonald dropped the F Bomb in Carnegie Hall") . She called this concert "Songs from My Living Room." She chose songs that she great up listening to as well as shouting out to the ladies who inspired her: Barbara Cook. Chita Rivera, Betty Buckley, Patti LuPone, Liza Minnelli. She especially sang in honor of Chita Rivera and Barbara Cook and said she hoped she would have a Broadway career like they have had. I think she'll do okay in that deparatment (6 Tonys and counting and she's only 44 years old). 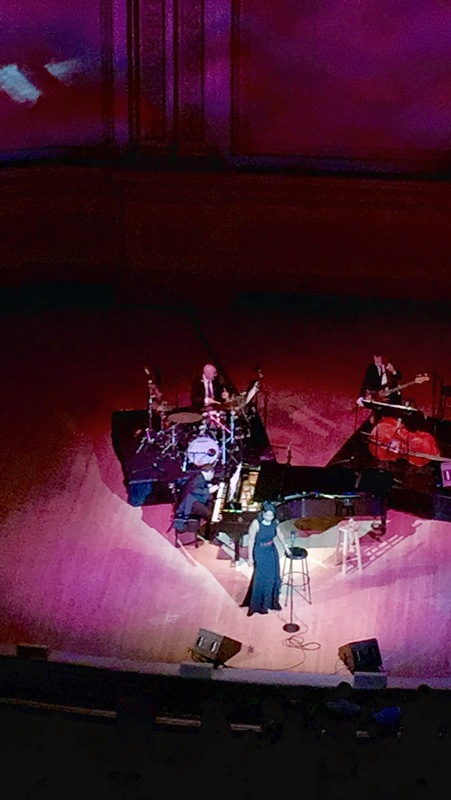 Seeing her in concert is like just hanging out with her friends, until she opens her mouth and out pours that huge, glorious, warm mezzo sound, not mention when she occassionaly throws in some soprano notes and your eyes want to roll back in your head.